The 47.24 metre motor yacht One More Toy, listed for sale by Mark Elliott at IYC, has had a further $1,000,000 price reduction. One More Toy was built in GRP by US yard Christensen to ABS class and delivered in 2001 with a refit in 2007. One More Toy is a fine example of a boat with classic beauty, exquisite style and impeccable taste. Her interior is decorated in fine fabrics with black walnut joinery throughout. MCA compliant, she has luxurious accommodation for 12 guests in six staterooms including an on-deck master suite with owner’s office and study and a VIP suite with a queen sized bed. Below deck lie three doubles and a twin plus two Pullman berths, and all cabins have entertainment centres and en suite bathroom facilities. In addition, there are quarters for 10 crew. The sky lounge is grand, giving the impression of a gentleman’s club, offering ample seating, a bar, card table and entertainment centre with plenty of room for complete relaxation. Recent upgrades on this yacht for sale include a full paint job, three new generators, new zero speed stabilisers and the completion of her 25 year ABS survey. Featuring an elevator to all decks, One More Toy has an enviable charter record and her twin 1,800hp MTU engines give her a cruising speed of 14 knots and a range of 3,500 nautical miles at 10 knots. 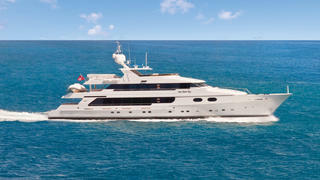 On display at the Palm Beach yacht show, One More Toy is now down to $12,900,000.